At the IWS Children’s Clinic, it’s our mission to deliver quality health care inside our clinic and out in Chicago’s communities. Our two unique outreach programs–the Portable Dentistry Program and Nutrition/Oral Health Presentations–help children and families understand why healthy practices and behaviors are important. Throughout the academic year, the Clinic sends our dentist, dental hygienist, and dental assistant to Chicago neighborhood schools to give children quality dental services that include fluoride, cleaning, and dental sealants. To prevent cavities, we apply thin plastic coatings to the chewing surfaces of the back teeth. These sealants harden to form a protective shield over the tooth. We operate this program with the help of our Children’s Clinic Van, three portable dental chairs and dental equipment. 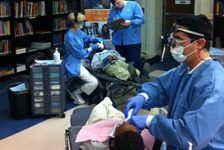 Over the years, our committed portable team has set up dental chairs in school libraries, hallways, and even kitchens. Each child receives quality dental services and goes home with a goody bag that includes pencils, stickers, informational handouts, and a brand new toothbrush. Parents also receive a chart detailing the services their child received and the condition of their teeth. In addition, the Clinic’s staff makes follow-up phone calls to all children with cavities urging them to schedule a dental appointment. Last year the Portable Dentistry team visited over 30 schools, attended many health fairs and treated 1,936 children. We rely on various grants to support these essential services. We recognize that health education contributes to healthy children. Our Nutrition and Oral Health presentations teach children and parents about healthy eating and healthy living practices. The Clinic’s age-specific presentations focus on different aspects of nutrition and how it affects on our bodies and teeth. We present these 15-20 minute interactive sessions to student or parent groups of all sizes at daycare or community centers, preschools, elementary schools and middle schools, Topics for our youngest children focus on everyday foods versus sometimes foods. As students mature we discuss such nutritional topics as how many grams of sugar are found in popular everyday foods. Our sessions are always interactive, and we incorporate games and activities to help reinforce the message of healthy living. Last year 5,244 kids were reached through our Oral Health and Nutrition Outreach Program with tips for caring for their teeth and eating healthy foods in 46 school based workshops. Health Education Outreach Coordinator, at vnovotny@childrenscliniciws.org or 708.848.0528 ext. 230.